Finally, what you've all been waiting for! This year's fall dining room look! Ok let's be real, I know no one has been on the edge of their seat waiting to see how I decorated my table this year. And if we are being honest, I decorated my table the first week of September...(we had one cold day and I got excited!) but, it took me a whole month to get around to taking pictures. It all started with this red plaid blanket scarf I found at Hobby Lobby. You can find these scarves cheap all over the place, or use one you already have. They are great for fall decorating. I've also spent the last couple of years collecting decorative orange pumpkins (like these HERE) but decided I wanted a slightly different look this year. So instead of buying all new pumpkins, I decided to paint mine. More on this in a separate blog post soon. I always say "use what you've got" and most of the time I'm pretty good bout sticking to that, although my husband would probably disagree. But, I did incorporate this empty tea container from Target that was in my pantry. If you haven't tried this tea its seriously AMAZING. It's perfect for fall and the tin containers are great for decorating or using as succulent planters. If we are going to stick to being real in this post, I only decorate my table so I can bust out my fancy china. Don't worry, I put it safely back in my china hutch as soon as I took the picture so nothing would happen to it and BJ wouldn't get any crazy ideas like eating off it. This gold silverware however, was a steal at $5 a set (normally $20) from Target. I've been eyeing it forever and couldn't resist buying it on sale. Thanks for stopping by! 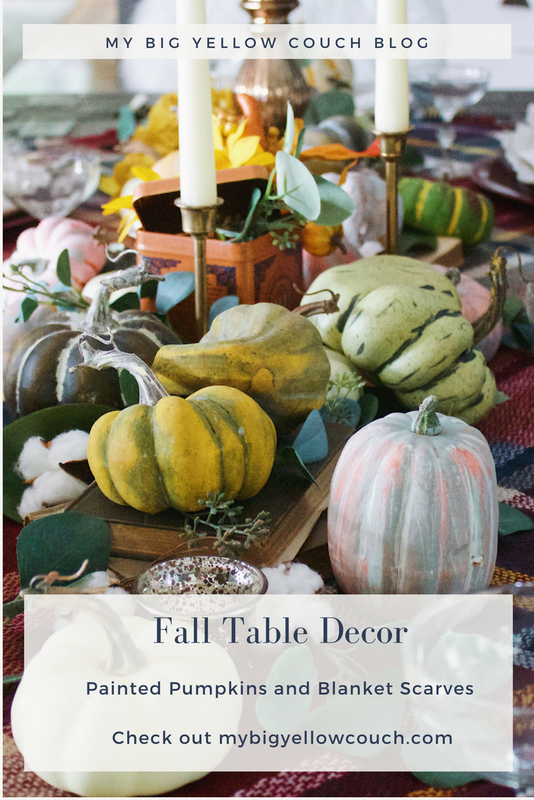 Let me know what you think about my fall table look in the comments below!